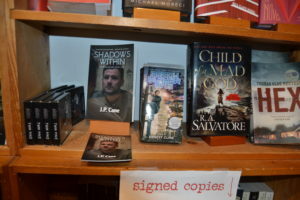 Last night I came upon an unexpected surprise while attending a JABBIES event at Fountain Bookstore, downtown Richmond. Browsing the books on offer I saw a familiar cover–mine! With Kelly Justice, owner of Fountain Bookstore and my book Shadows Within. Shop owner Kelly Justice had recently ordered Shadows Within and put it on her shelves, facing out, along with the postcards I use to hand out to readers. Awesome night! 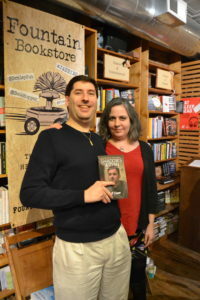 And the event with Craig Burke, Vice President of Berkley Books, was good too. He has worked a long time in the industry as a publicist. 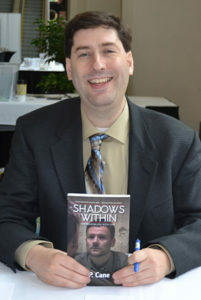 He spoke about his experience in that world, giving fun insight on its inner workings, which is often a mystery to authors.